Use your iPhone 7 while covered front and back with the Moshi SenseCover Touch Sensitive Flip Case in black. It features a leatherette front cover that uses embedded proprietary SensArray pads to allow you to answer and talk on the phone without having to open the cover. The back and sides are protected by a hard TPU frame for 360° of everyday protection against bumps and scratches. You can also check the date and time, reject calls, and swipe away alarms all without opening the cover. It also features a scratch resistant viewing window, so you can see important information without having to open the cover. 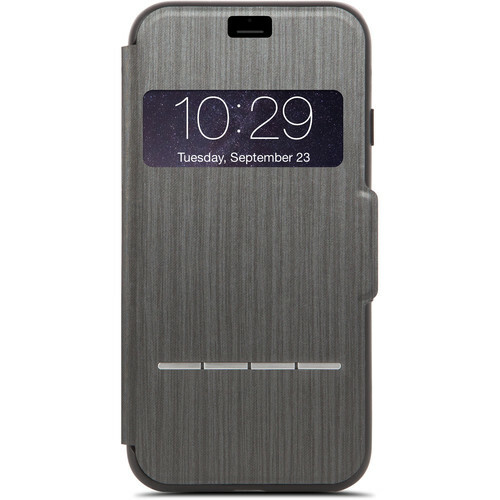 The cover can be held closed or folded back with the magnetic clasp located on the right side, and all buttons and cameras are accessible while your phone is in the case. Box Dimensions (LxWxH) 7.7 x 3.6 x 0.8"
SenseCover Touch-Sensitive Flip Case for iPhone 7 (Black) is rated 4.0 out of 5 by 1.